My name’s Lawson Aschenbach and I’m in my second year of racing a Civic with Compass360 Racing – in my second series with the team. Last year, I partnered with David Thilenius to win the Street Tuner class drivers’, team and manufacturers’ championships in Grand-Am’s Continental Tire Sports Car Challenge Series. 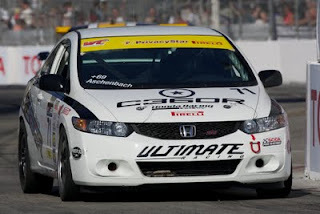 For 2011, I’ve switched to SCCA Pro Racing’s Pirelli World Challenge Championships. I won a championship in this series in 2006 in the GT class, but now I’m in the Touring Car class. We were fortunate that success was immediate in our new endeavor. At the season opener, a street race in St. Petersburg, Fla., we won the first time out. I suppose I should be surprised, but I’m not. It all comes down to the car, the team, the driver and the tires. Everything is an important piece of the puzzle, and I knew coming in that we had a good package. We expected to compete for wins, and we proved it right out of the box. Fortunately for us, that first weekend there were a lot of new teams, new cars and new drivers and often, it takes them some time to gel and get their packages together. We knew we had a chance to pounce on everybody right away and come out with two good finishes. But even though we had success there, we knew people were going to catch up; we knew people were going to be pushing hard, as we were, and we knew it was going to be a fight. 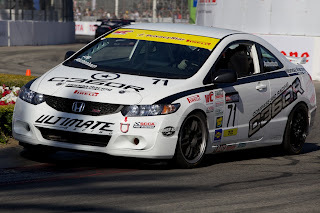 We had an edge in that our Pirelli World Challenge Civics, built by Honda Performance Development, are very similar to the cars that we ran in the Continental Tires series. Last year we ran a four-door, this year it’s two; I was surprised at how similar they were – there wasn’t a huge difference as far as I could tell. I think the biggest difference is the tires. You’re coming from a street-based tire in the Continental Tire series to a full-blown racing slick in World Challenge; that was the biggest variable. It was just a matter of fine-tuning and tweaking a little bit for World Challenge competition. It didn’t take long to figure out and we’ve got a great Technical Director with Ray Lee at Compass360. He knows these cars so well and can really sort things out. It’s one example of how great things start at the top. Team owner Karl Thompson has given me a terrific opportunity, for which I am very grateful, and between him, Lee, and World Challenge Program Director Enrico Diano, the people steering this thing are building a top-notch team. With the Grand-Am Series being an endurance racing series and World Challenge being a sprint racing series, in which the races are typically 50 minutes long and there are no (planned) pit stops, there are some slight differences in driving. It comes down to a little bit of aggressiveness. I have to push my limits a little bit more. I have to push braking points, push the mid-corner speeds. Your whole game has to be stepped up just a little bit. The racing is the same, but you have to push yourself a little bit harder and push the overall package a little bit more. It worked out for us at St. Petersburg. In Long Beach, I got caught up in someone else’s accident after qualifying on the pole. And at Miller Motorsports Park in Utah, we we re a bit surprised at how far some of the other teams have come along. Winning races right now is very important. It’s too early in the season to focus on the championship, although after four races we are leading the points and I think it is certainly within reach. If we win races now, we can hopefully build a points lead for the end of the season. Last year, we had a couple of bad races toward the end, some unfortunate things that had nothing to do with the team or the cars, that took us from a huge lead to a pretty big deficit. I have to try to stay clean, stay on the track and try to finish every race at the front, or as close to the front as I can. That shouldn’t be difficult with this setup. The Civic, as it comes from the factory, handles great. It’s quick enough and it’s got everything you need to win in racing. Honda knows the type of car that can perform on the street and on the track. That type of knowledge, that awareness while they’re engineering these cars can create a machine that works for both. 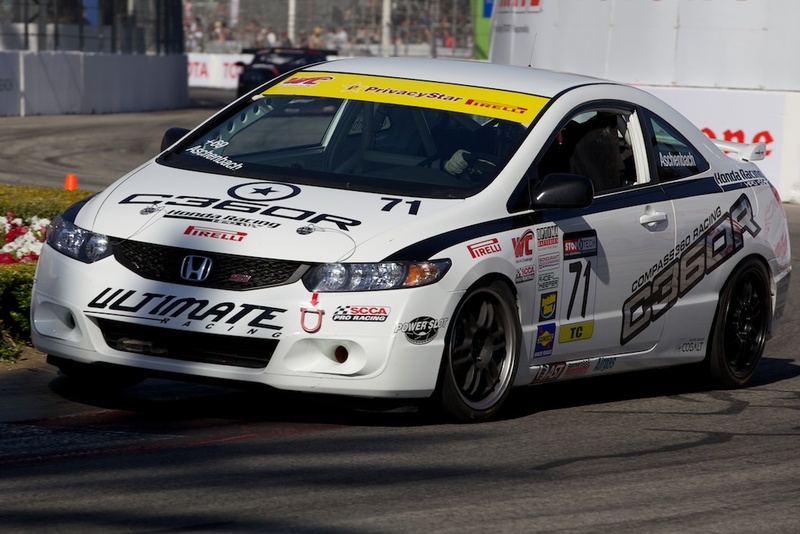 The relationship with Honda Performance Development helps tremendously. They know these cars and, with minor tweaks, we know these cars can win any given weekend on any given track, As a driver, you want to drive a car that has the full package, and that’s what Honda brings to the table. 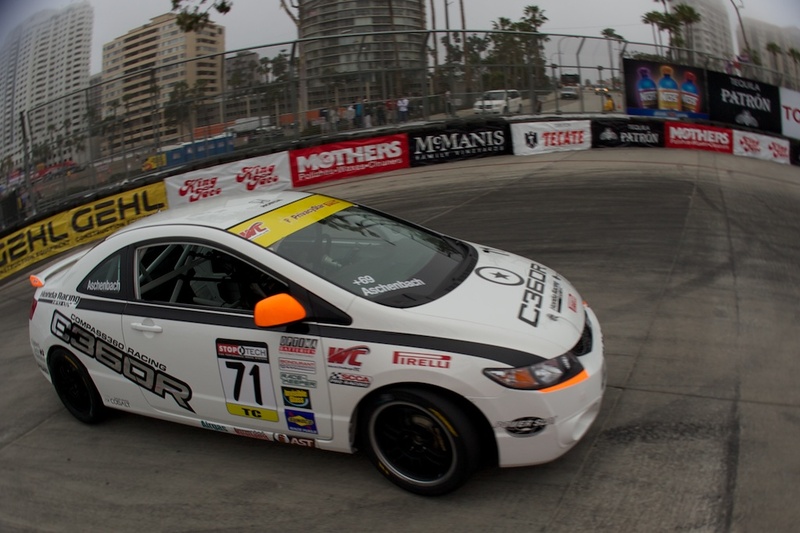 I’m looking forward to showing more of what the Civic, Compass360 Racing and I – with the help of great sponsors like OMP, Piloti Shoes, Hartmann Luggage and Corsa Car Care – can do as the Pirelli World Challenge Championships season progresses. 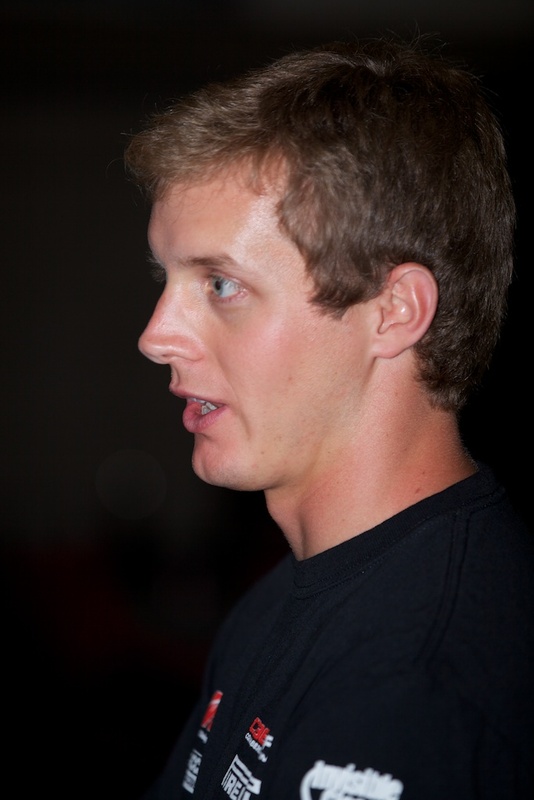 Look for Lawson Aschenbach, Compass360 Racing and the rest of the Pirelli World Challenge competitors at Mid-Ohio Sports Car Course on Aug. 5-7, followed by Infineon Raceway near Sonoma, Calif., later in the month. Or catch the series on Versus.